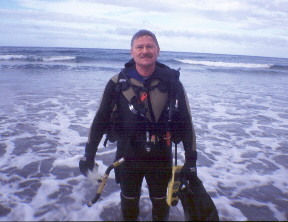 On any early weekend morning and sometimes during the week when he gets a chance, fellow San Diego UPS member and veteran La Jolla Shores diver Steve Gardner can be seen getting into his distinctive "bumble bee" wetsuit for yet another exciting shores dive. Steve has few peers in his knowledge of the shores underwater terrain and its fauna. After having logged a number of dives with Steve at the shores, it is very evident that branching photographic opportunities abound in this area for those who are willing to seek out these sometimes elusive ocean dwellers. Steve is particulary fond of the nudibranchs and has graciously consented to putting some of his images for the rest of us to enjoy! 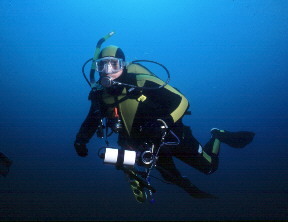 Before throwing your gear into the car in anticipation of a great dive at the shores, you may want to take a look at a video snapshot of the shores area updated hourly courtesy of the Coastal Imaging Lab, in the College of Oceanic and Atmospheric Sciences at Oregon State University to check out surf conditions. Let us now enjoy the fruits of Steve's labors, some of the beautiful images recorded during his many years of diving at the shores.